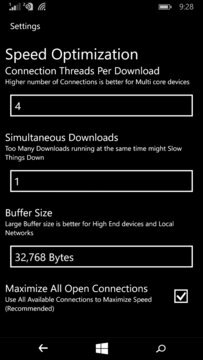 ⚡ TDM The First Downloader app for Windows Phones with acceleration features. TDM uses multi-threaded connections with Wifi and Cell Network at the Same Time to increase your download speed. Long Press on a link from your favorite Web Browser with "Share Link" or "Share Webpage" and choose "Turbo Download Manager" and start your download in turbo speed. ☆With over 4 Million Downloads for the Android platform TDM is now available for Windows Phones! ⚡ TDM is an excellent tool for those who are constantly in touch with the web. An Easy and Fast way to share a link from your Web Browser and download all type of files from movies, roms, pictures, music, zip, pdf and other very large documents files without waiting for hours for your downloads to complete. Turbo boost your speed by enabling multi threading and fine tune it with additional speed performance settings. You can pause and resume anytime. Download Acceleration with up to 5 multi-threaded connections for the same download! Boost Network Mode: Download using Wifi and Cellular Network for the same download at the same time! Get All Files from Webpages. TDM works with Internet Explorer and most Web Browsers to let you Download Files Faster from Web Pages. For Browsers that don't share links use copy/paste. TDM downloads Files from Servers only using Direct Links. TDM does NOT work with File Sharing Sites that require login or authentication. TDM does NOT work with YouTube due to TOS. * Some Web Servers might not support multiple connections, if so use "Connections per Download" = 1 under "Settings".